The Renault Twin'Z is part of a series of concept cars, demonstrating ‘Love’, ‘Exploration’, ‘the Family’, ‘Work’, ‘Play’, and 'Life'. Renault is showing a new concept electric car at the Salone Internazionale del Mobile di Milano. The Twin'Z is an ultra-compact city car based on the Renault Twingo, and features a design that's supposed to embody Play, and using elements inspired by nature. 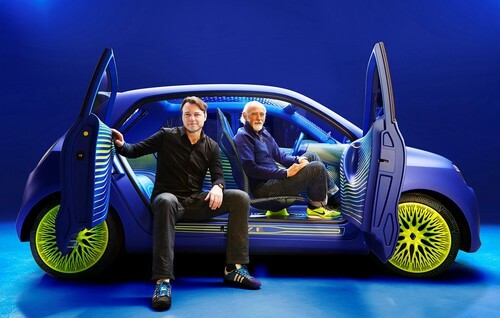 The Twin'Z is the result of a partnership between Renault and British designer Ross Lovegrove. It is part of a series of concept cars from Renault that embody elements of that company's design strategy. The elements, ‘Love’, ‘Exploration’, ‘the Family’, ‘Work’, ‘Play’, and 'Life', are meant to represent phases of human life, in keeping with Renault's overall strategy to accompany its customers in every phase of their life. Lovegrove's design is inspired by nature, using shapes and forms that are supposed to evoke playfulness and the natural world. There are LED lights embedded into the surface of the car and inside the all-glass roof. These lights provide animations on the surface of the car, and for example the rear brake lights are animated rather than simple on-off lights. The ultra-minimal interior is meant to give a feeling of spaciousness, important for such a small car. The interior features more LED lighting in stripes along the walls, and other patterns on the floors. The dashboard is simply a tablet computer, and a place to dock ones smart phone. The overall design of the Twin'Z is that of an ultra-compact with the wheels pushed way out to the corners to give more interior space. While it's just 3.62 meters overall length (11.8 feet) the interior will seat four people, and it is a four-door. The doors are hinged front and rear (respectively) in the arrangement popularly called "suicide doors". Because there is no column between the front and rear seats (no "B Column"), when the doors are open you have unfettered access to the interior. The electric drive train consists of a rear-mounted 50kW (68hp) synchronous electric motor, running at 96 volts, and delivering 226Nm maximum torque. The top speed is around 80 miles/hr, and range around 100 miles. It's a concept car, meaning it may never reach production and even if it does there are many designer flourishes that are unlikely to be in a production car. The Twingo platform is shared between Renault and Smart, meaning that the Twin'Z could influence either or both of those cars.